I am a collector from long back. 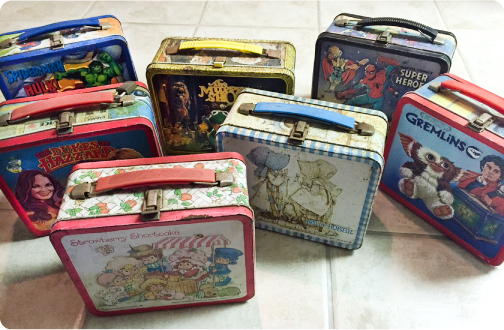 As a young girl I began and abandoned a few collections. Two that I remember well were brooches and key chains. Where all the items are now I have no idea. Mayhaps they are someone else’s treasure now. 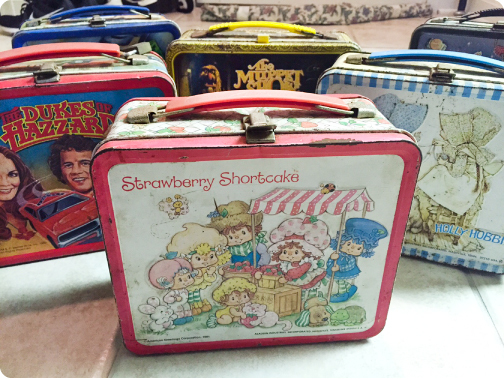 When I serendipitously found a strawberry shortcake lunch box while rummaging around a Salvation Army shop a new obsession began. When she was just a lonely lunch pail I used her as my purse. Très chic I know. My father told me that a collection has to be items of likeness amounting to 3 or more, so when I amassed three, I shelved her with her counterparts. 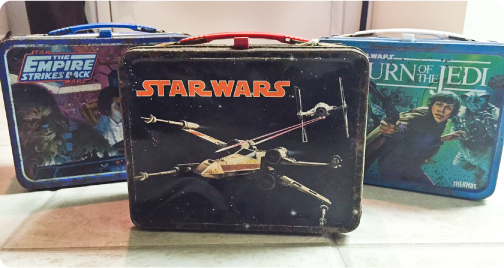 My husband is involved with the collection, we have hunted down and purchased the Star Wars, Empire Strikes Back and Return of the Jedi old tin lunch pails. Our boys too have a hand in some of the boxes- spider man is there along with another Marvel comic book heroes box. My favourites are my choices and gifts from those who know me well. My husband surprised me with a Muppets along with The Dark Crystal, my sister with The Gremlins. Unfortunately they are all looking a little rough and pitted from their sojourn in Hawaii. Salty air isn’t healthy for everything, but they are, to us, still delightful.